ODEPC Registration is mandatory for any nurse who wants to get recruited by ODEPC or attend any recruitment fair conducted by ODEPC. 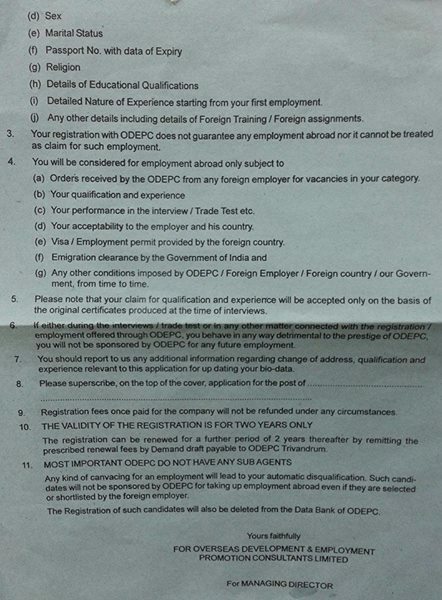 ODEPC is Overseas Development and Employment Promotion Council owned by Government of Kerala. Even though ODEPC is owned by Kerala Govt, by new rule change made by Govt of Inda in 2015 all nurses recruitment should be conducted by ODEPC, Norka Roots (another agency owned by Govt of Kerala), OMCL (Agency owned by Govt of Tamil Nadu). But one fact every nurse should understand in this regard. That is not only keralites or tamilians all Indian nurses can apply for recruitment via ODEPC, Norka roots and OMCL. In this article we will give information regarding procedures involved ODEPC Registration by nurses in India. All Indian Nurses can register with ODEPC irrespective of whether they are keralites or not. But unlike Norka Roots, ODEPC charges Rs. 250 for registration. The registered profiles will be searched and shortlisted for various job opportunities with ODEPC Clients. How to Get ODEPC Registration? There are two methods for registration with ODEPC. In the first stage, you will create an account by providing a valid email id and personal details. In the second stage you can add your academic details like educational Qualifications, Certifications etc. In the third stage, you can enter your Preferences, Experience and Professional details. In the Fourth stage, the Contact Address details, Language Proficiency details, Work Authentication and Personal Description can be added. In the fifth stage, you can pay online via the link recieved in your email. After registering online, you need to take a print out of the application form and send to ODEPC office along with the Demand draft. The application form and the Demand draft must reach ODEPC Ltd., within 20 days from the date of issue of the online payment reciept. Your registration will be approved only after verifying the demand draft and the application form. After registering with ODEPC, in the ‘My Accounts’ page, a notification will display regarding making the Payment. Click on the ‘click here to enter payment details’ link. In the DD Details page opened, select the Recruitment Category options. In the ‘Please choose the Payment Mode’ section, enter the DD No., DD Date, Amount and Bank details. Click Submit button. The recruitment process of the Job Seeker will get activated in ODEPC Job Portal only after the administrator approves the DD Payment details. When the Administrator approves/rejects a payment, email intimation will be sent to the Job Seeker. 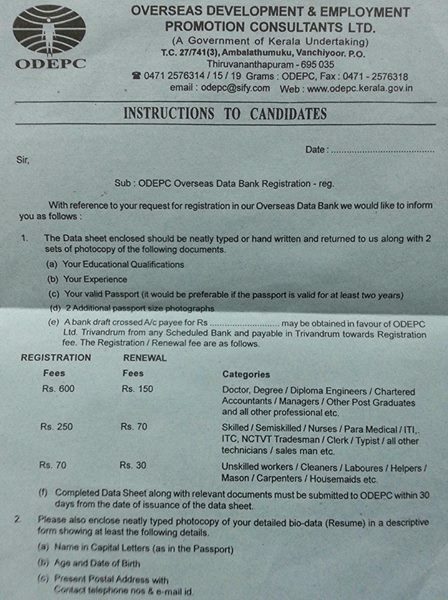 For offline ODEPC Registration, first of all candidates have to go to ODEPC Office in Vanchiyur, Trivandrum. Application form cost is Rs. 30. You have to attatch 2 sets of Xerox certificates and 2 passport size photos. If you have any further doubts/queries, you can go through the instructions given in the odepc website. It will take a minimum of 3 – 4 weeks for getting ODEPC Registration after sending the offline application. ODEPC team will review the resume and if found suitable, will consider the resume for further procedures of the job. If you got selected for a job interview, the hall ticket can be downloaded from the site. We also have attached some leaflets regarding ODEPC registration along with the post. You can see them below.